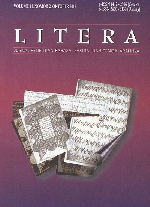 LITERA, the International Journal of Linguistics, Literature, and Their Teaching, with ISSN 1412-2596 (Print) and ISSN 2460-8319 (Online), first published in April 2002 by the Faculty of Languages and Arts, Universitas Negeri Yogyakarta. LITERA has been re-accredited by Indonesian Ministry of Education and Culture decision Number 36a/E/KPT/2016 which is valid for five years since enacted on 23 May 2016. The journal has been accredited by Ministry of Research, Technology and Higher Education of the Republic of Indonesia since December 2017, as an achievement for the peer-reviewed journal with excellent quality in management and publication. The recognition published in Director Decree No. 51/E/KPT/2017 December 4, 2017, and effective until 2022. Submitted papers must be written in English for an initial screening by editors and further review process by at least two anonymous reviewers. The guidelines for authors are available here. Papers that do not meet the basic requirements of author guidelines will not be further processed. Editor in Chief Prof. Soenarto Ph.D. 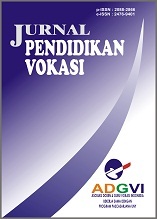 Description Jurnal Pendidikan Vokasi is published by the Asosiasi Dosen dan Guru Vokasi Indonesia (ADGVI) – Association of Vocational Lecturers and Teachers of Indonesia cooperated with Program Pascasarjana Universitas Negeri Yogyakarta or the Graduate School of Yogyakarta State University. The journal is aimed at publishing and disseminating the results of researches and studies on vocational education conducted by researchers, teachers, and practitioners of vocational education and vocation. Focus & Scope The scope of Jurnal Pendidikan Vokasi includes philosophy, curriculum, learning, evaluation, management, and policies on vocational education. In addition, studies in global scope related to technical and vocational education and training areas which become the object of the study can also be published in this journal. 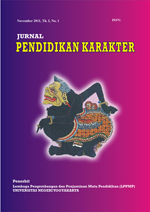 Jurnal Pendidikan Karakter is a high quality open access peer reviewed research journal that is published by Institute of Educational Development and Quality Assurance of Yogyakarta State University (LPPMP - UNY). It publishes scientific manuscripts containing substances of character education in form of conceptual thinking, results of study, and results of research that contributed to the understand, develop, and implement character education. 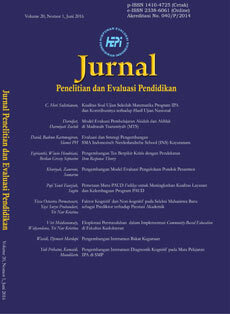 Jurnal Pendidikan Karakter very welcomes and acknowledges high quality theoretical and empirical original research papers, case studies, review papers, literature reviews, book reviews, conceptual framework, analytical and simulation models, technical note about education at any topic from researchers, academicians, professional, practitioners and students from all over the world. Editor in Chief Prof. Dr. Siti Irene Astuti Dwiningrum, M.Si. Focus & Scope Jurnal Pembangunan Pendidikan: Fondasi & Aplikasi (JPPFA) is interested in comparative studies that lead to new insights and challenge of orthodox theories; that have potential for policy impact; and that apply to broad range of settings, including industrial democracies as well as low and middle income countries, countries in political transition and countries recovering from armed conflict and social unrest. JPPFA also considers papers that look at education and development through the policies and practices of official development assistance and commercial education trade. JPPFA engages these approaches to deepen the understanding of the relationship between education policy and development. 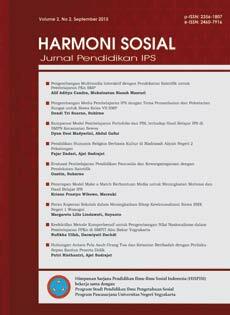 Editor in Chief Prof. Zamroni, Ph.D.
Focus & Scope Harmoni Sosial: Jurnal Pendidikan IPS publishes and disseminates research result and analysis on integrated social sciences, history, economics, sociology, geography, and other relevant social sciences. The journal is expected to be beneficial to the development of social sciences comprehensively and educational social sciences specifically. 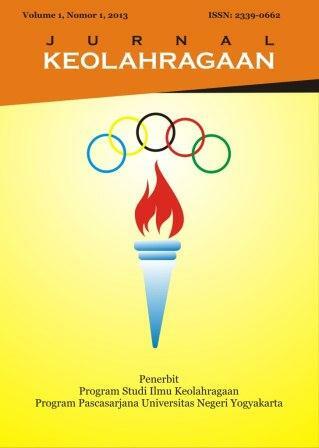 Keolahragaan Journal is a journal published by the Departement of Sport Science, the Graduate School of Yogyakarta State University. The journal is published twice a year, April and September. 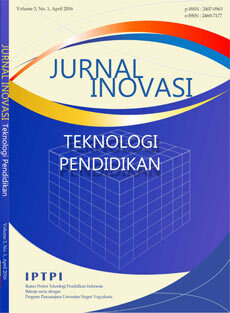 Editor in Chief Prof. Herman Dwi Surjono, Ph.D.
Focus & Scope Jurnal Inovasi Teknologi Pendidikan is a scientific journal which publishes and disseminates the results of researches, deep studies, innovative thinking or work in educational technology. The focus of the journal is innovative works on the development of educational multimedia and e-learning which are effective in giving positive contributions to schools and educational institutions. LingTera is a peer reviewed open-access journal. 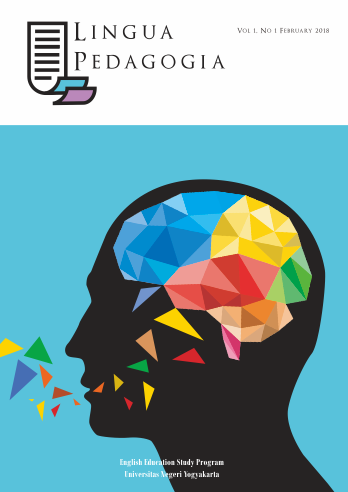 The journal invites scientists throughout the world to exchange and disseminates the results of researches and scientific studies on Linguistics in its various applied contexts. Submitted papers can be written in English or Bahasa Indonesia for initial review stage by editors and further review process by reviewer. The Lingua Pedagogia is peer-reviewed journal that seeks to advance knowledge and practice in all areas of EFL teaching. The journal publishes empirical, theoretical, methodological, and practice-oriented articles and book reviews covering topics relevant to EFL teaching biannually. Particular consideration is given to empirical (research-based) articles using quantitative, qualitative, and mixed methodology. Each issue of this journal is not limited to comprehensive syntheses of studies towards developing new understandings of English teaching, but also explores scholarly analyses of issues and trends in the field. 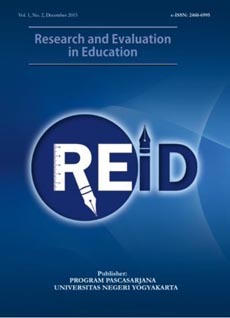 Focus & Scope REiD (Research and Evaluation in Education) publishes high-quality research manuscripts of assessment, evaluation, and methodological studies in varied educational settings and disciplines with their own particular phenomena, as well as relevant studies that address issues of current education concern. 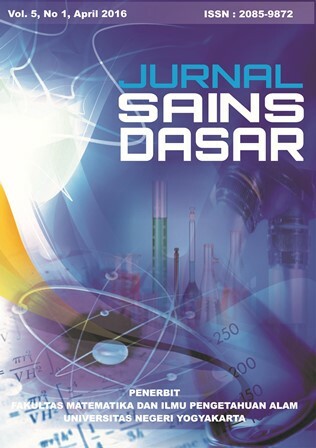 Jurnal Sains Dasar is a peer-reviewed scholarly publication in the area of basic sciences that publishes original paper from regular research, letters and review articles on but not limited to: mathematics, chemistry, physics, and biology. 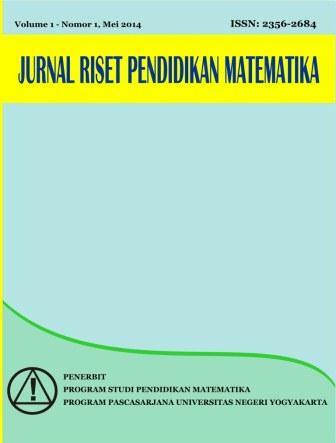 Jurnal Sains Dasar is issued and published twice a year (April and November) by Faculty of Mathematics and Natural Sciences, Yogyakarta State University and is reviewed by a group of eminent researchers. 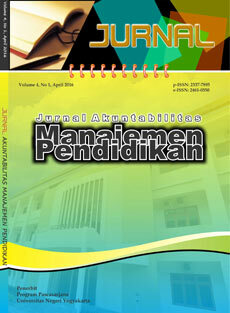 Jurnal Sains Dasar with ISSN 2085-9872 (printed) and ISSN 2443-1273 (online). INFORMASI published by Departement of Communication, Faculty of Social Science Yogyakarta State University since 1970 and Ikatan Sarjana Komunikasi Indonesia (ISKI) based on memorandum of understanding 05/MoU/Jurnal/ISKI/X/2018-01/MoU/INFORMASI/ILKOMUNY/X/2018. INFORMASI is an academic journal that centered in communication, is open and welcoming to contributions from the many disciplines and approaches that meet at the crossroads that is communication study. We are interested in scholarship that crosses disciplinary lines and speaks to readers from a range of theoretical and methodological perspectives. In other words, INFORMASI will be a forum for scholars when they address the wider audiences of our many sub-fields and specialties, rather than the location for the narrower conversations more appropriately conducted within more specialized journals. INFORMASI published twice a year (June and December) in Bahasa Indonesia or English. This journal, serving as a forum for the study of communication in Indonesia and other parts of the world within its local and challenging global context, supports focused studies of particular theme and interdisciplinary studies. INFORMASI has become a medium of diffusion and exchange of ideas and research findings, so much so that researchers, writers, and readers from various traditions of learning have interacted in the scholarly manner. Nominal: Barometer Riset Akuntansi dan Manjemen adalah jurnal yang dikelola oleh Program Studi Akuntansi (S1), Fakultas Ekonomi Universitas Negeri Yogyakarta. 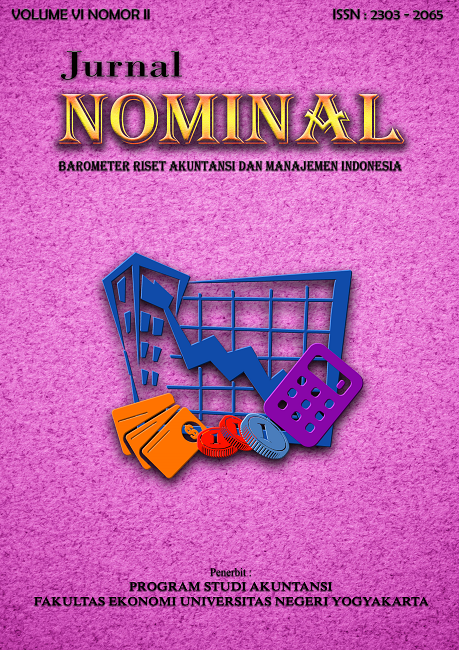 Nominal: Barometer Riset Akuntansi dan Manajemen berisi hasil penelitian dedaktik, metodik, dan empirik ilmu akuntansi. Jurnal ini berisi penelitain baik kualitatif maupun kuantitatif. Auditing, Akuntansi Manajemen, Sistem Informasi Akuntansi, Akuntansi Keuangan, Akuntansi Syariah, Teori akuntansi, Akuntansi Keperilakuan, Akuntansi Sektor Publik, Sistem Pengendalian Manajemen, Manajemen Keuangan, Sistem Informasi Manajemen, Manajemen Sistem Informasi dan Manajemen Biaya. 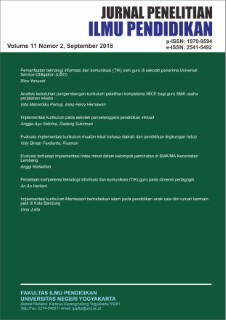 Jurnal NOMINAL terbit secara berkala yaitu tiap bulan APRIL dan SEPTEMBER dengan rata-rata jumlah artikel sebanyak 10 artikel tiap edisi. 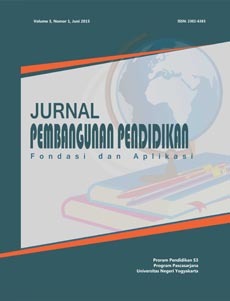 Jurnal Pendidikan Anak is a scientific publication of research result, literature review, or both in interdisciplinary early childhood education. Issued June and December of each year. Journal of Science Education Research is a journal published by Universitas Negeri Yogyakarta, which contains articles on research in Science and Science Education. 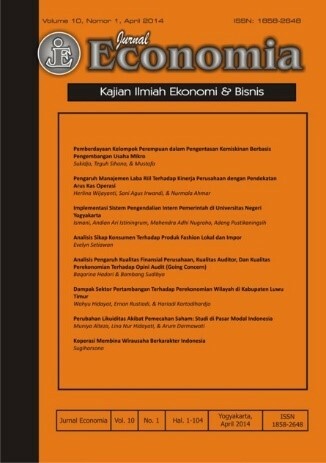 HEJ: Home Economic Journal merupakan jurnal ilmiah nasional sebagai media untuk mempublikasikan hasil penelitian, wadah pertukaran, pengembangan, dan desiminasi ilmu pengetahuan dalam ruang lingkup pendidikan vokasional di bidang boga, busana, rias bagi para akademisi, peneliti maupun praktisi. SOCIA is a scientific journal which managed by Faculty of Social Sciences . This journal focuses on the publication of the results of scientific research related to the field of social studies. The published article originated from researchers, academicians, professional, and practitioners from all over the world. 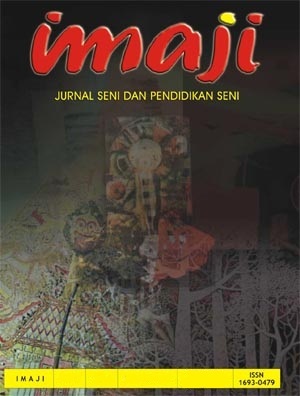 JPAI adalah jurnal yang berisi kajian dedaktik, metodik, dan empirik tentang pendidikan akuntansi dan ilmu akuntansi murni yang diterbitkan oleh Jurusan Pendidikan Akuntansi Fakultas Ekonomi Universitas Negeri Yogyakarta. 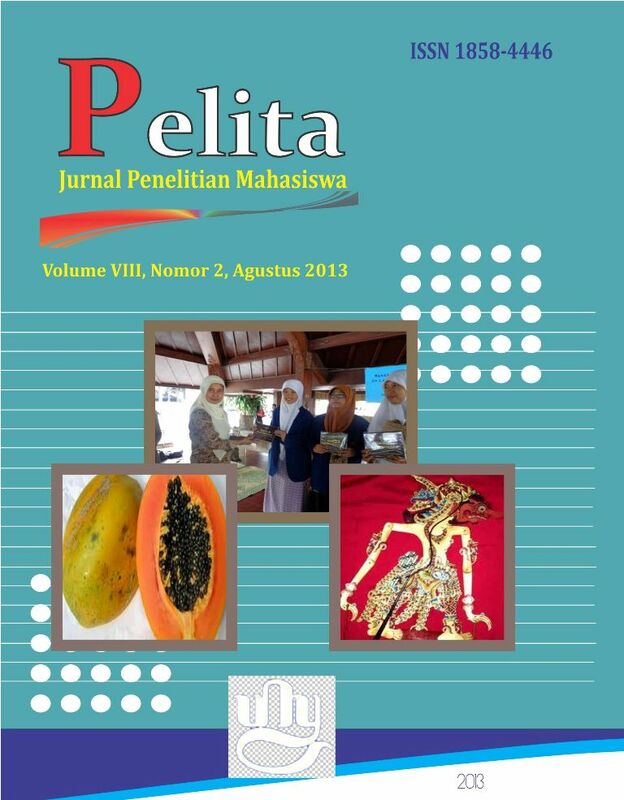 Jurnal Penelitian Ilmu Pendidikan is a high quality open access peer reviewed journal that is published by Faculty of Education, Universitas Negeri Yogyakarta. 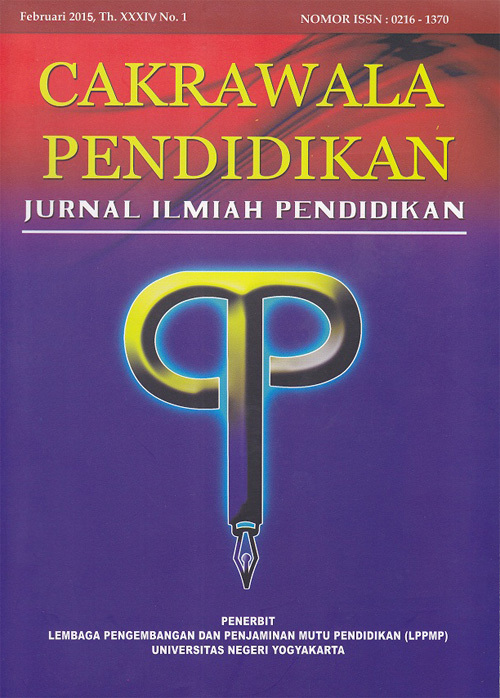 Jurnal Penelitian Ilmu Pendidikan a platform for researchers, academicians, professional, practitioners and students to impart and share knowledge in the form of high quality empirical and theoretical research papers, and case studies. Jurnal Penelitian Ilmu Pendidikan welcomes and acknowledges high quality theoretical and empirical research papers, case studies, review papers, analytical and simulation models in any topic of education areas. 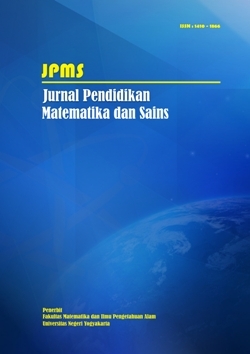 Jurnal Penelitian Saintek (JPS) is a journal that publishes articles relating to the development of science and technology based on research results that have never been published. Jurnal Penelitian Humaniora diterbitkan oleh Lembaga Penelitian dan Pengabdian kepada Masyarakat (LPPM) Universitas Negeri Yogyakarta. 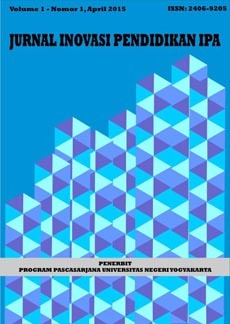 Jurnal Penelitian Humaniora is published by Institute of Research and Community Service, Yogyakarta State University. INERSIA is stand for INformasi dan Ekspose hasil Riset Teknik SIpil dan Arsitektur. This scientific journal is managed by the Department of Civil Engineering and Planning Education, Faculty of Engineering, Yogyakarta State University, in cooperation with the Persatuan Insinyur Indonesia (PII). 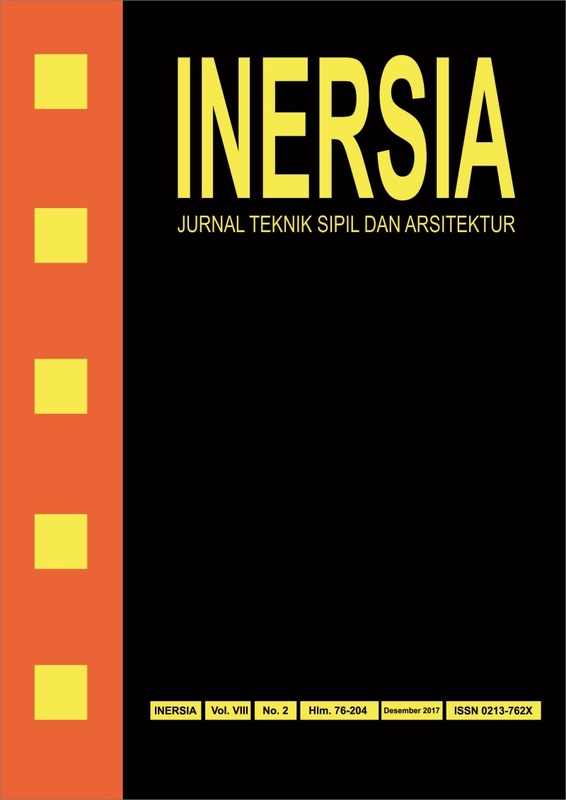 It publishes and disseminates research results from lecturers and post graduate students from various universities in Indonesia, which has contributed to the development of science and technology, especially in the field of Civil Engineering and Architecture. INERSIA is published twice a year, in May and December. 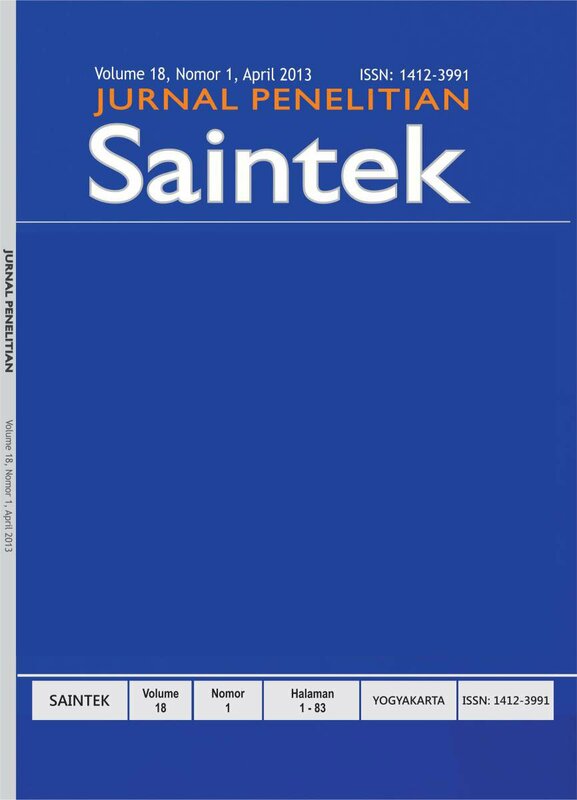 Each edition contains 8-10 scientific articles related to Civil Engineering and Architecture. EFISIENSI - Kajian Ilmu Administrasi adalah jurnal ilmiah dari hasil penelitian dalam bidang ilmu administrasi perkantoran baik dalam bidang kependidikan maupun dalam bidang ilmu administrasi murni dengan fokus dan ruang lingkup pembahasan tentang: 1) Pendidikan Vokasi Administrasi Perkantoran, 2) Manajemen Sumber Daya Perkantoran, 3) Administrasi/Manajemen Perkantoran, 4) Otomatisasi Perkantoran, 5) Teknologi Perkantoran, 6) Hubungan Masyarakat, 7) Simulasi Perkantoran, 8) Manajemen Event, 9) Pelayanan Prima, 10) Kesekretarisan, 11) Korespondensi, 12) Komunikasi, 13) Organisasi, dan 14) Kearsipan. Jurnal ini diterbitkan oleh Jurusan Pendidikan Administrasi FE UNY secara berkala satu tahun dua kali yakni pada bulan Februari dan Agustus. Kami mengundang Bapak/Ibu/Sdra/Sdri berpartisipasi mengirimkan naskah untuk diterbitkan pada jurnal ini. Naskah untuk diterbitkan edisi Agustus 2019 kami tunggu hingga tanggal 1 Juni 2019. Panduan sebagai penulis dapat dipelajari disini dan template pedoman penulisan naskah dapat diunduh disini. Focus & Scope Jurnal Pendidikan Jasmani Indonesia is a high quality open access peer reviewed research journal that is published by Faculty of Sport Sciences of Universitas Negeri Yogyakarta (FIK-UNY). 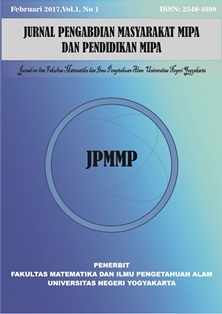 Jurnal Pendidikan Jasmani Indonesia is providing a platform that welcomes and acknowledges high quality empirical original research papers about physical education written by researchers, academicians, professional, and practitioners from all over the world. 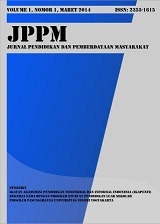 Jurnal Pendidikan Jasmani Indonesia is a high quality open access peer reviewed research journal that is published by Faculty of Sport Sciences of Yogyakarta State University (FIK-UNY). 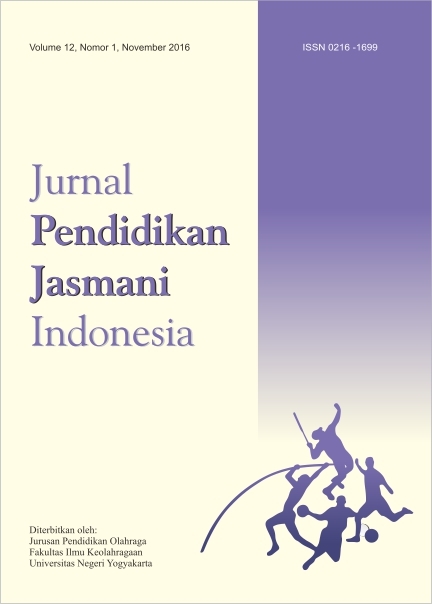 Jurnal Pendidikan Jasmani Indonesia (JPJI) is providing a platform that welcomes and acknowledges high quality empirical original research papers about physical education written by researchers, academicians, professional, and practitioners from all over the world. 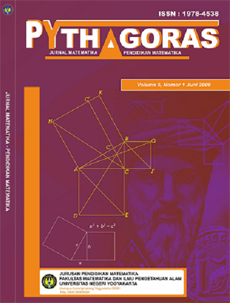 Jurnal Pendidikan Matematika dan Sains adalah jurnal yang diterbitkan oleh Fakultas MIPA UNY, yang berisi tentang artikel hasil kajian dan penelitian di bidang Matematika dan Sains. 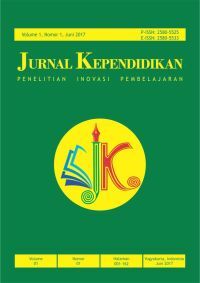 JIPSINDO, an academic journal that centered in social studies i.e social education (curriculum, teaching, instructional media, and evaluation), moral education, and multicultural education. We are interested in scholarship that crosses disciplinary lines and speaks to readers from a range of theoretical and methodological perspectives. 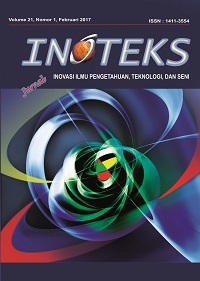 ELINVO (Electronics, Informatics and Vocational Education) is a peer-reviewed journal that publishes high quality scientific articles in Indonesian language or English in the form of research results (the main priority) and or review studies in the field of electronics and informatics both in terms of their technological and educational development. ELINVO accepts the scientific articles in the field of electronics and informatics from national and international academicians and researchers. ELINVO is published twice a year by the Department of Electronic Engineering Education, Faculty of Engineering, Yogyakarta State University. ELINVO Editorial Team consists of editors who have experience in writing articles both nationally and internationally (scopus), this information is available in detail in the Editorial Team page. ELINVO has a house style consisting of Title, Author Identity, Abstract, Keyword, Introduction, Methods, Results, Conclusion and References. It can be accessed in the Author Guidelines page. The process of editing the article through the review process is conducted by at least two (2) reviewers who are competent in their fields. The accepted articles are decided by the editor-in-chief based on the editorial board's recommendation. Plagiarism screening is conducted through google scholar. This information is available in details in the Policies page. 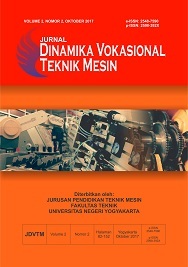 Jurnal Pendidikan Vokasi Otomotif is a peer reviewed open-access journal which publishes automotive engineering education. Every submitted manuscript will be reviewed by at least two peer-reviewers using double blind review method.